It’s time to make the switch! Read on for more information. If you’re looking to shop local and help support American workers, consider “Made in the USA menstrual cups.” These days, there is an ever-increasing numbers of choices for menstrual cups made in America. You’re spoiled for choice in fact! Menstrual cups that are made in America are usually made from top-quality medical grade silicone. They are also made according to the strictest manufacturing standards are are an infinitely better than the cheap menstrual cups made in China. What about the Cheaper Ones from China? Menstrual cups from China, although cheap aren’t a great buy. They aren’t made from top-quality materials. The material is often so flimsy that they never really fully open. The result is that these cups often leak like crazy. These cups aren’t manufactured according to strict standards and it’s not a product we recommend putting inside of you. Give them a wide berth, and instead stick with a top-quality cup. Here at Reusable Menstrual Cups, we strongly prefer menstrual cups made in the USA (see below), Canada (the Diva Cup), or European made menstrual cups like the Moon Cup, MeLuna Cup, or the Lunette Cup. Keep on reading for our top picks for Made in the USA Menstrual Cups. 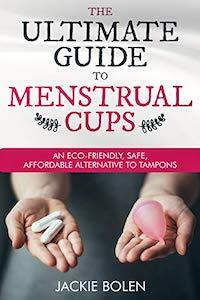 Keep on reading for all the details and a quick review of each of these popular, made in the USA menstrual cups. 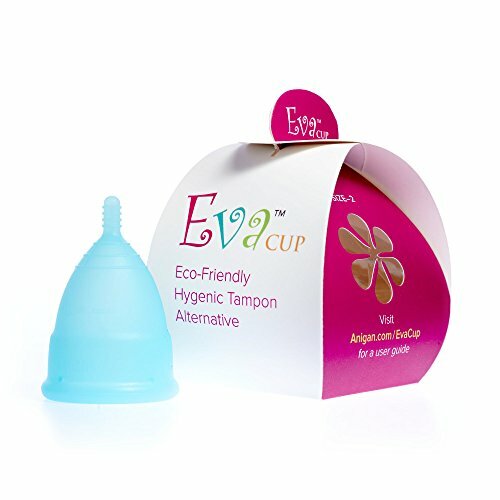 The Anigan EvaCup is a newcomer to the world of menstrual cups. However, they’ve made a big impact in a really short amount of time. The Evacup has a very high user rating on Amazon. It also comes in eight colours and is very reasonably priced. 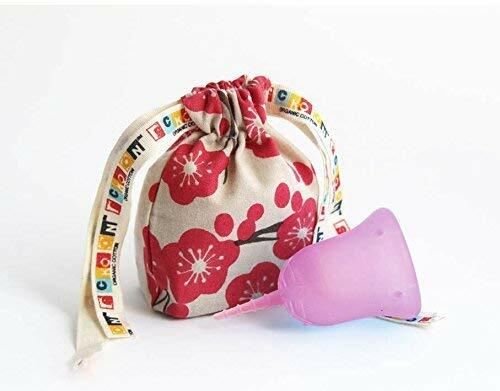 This period cup is particularly good for people with really heavy periods because the large size has a capacity of 37 ml and it can give you some great protection during a heavy flow. You can wear it all day long at work or school, and also overnight. This is quite a bit more than most other cups which range between 25 ml and 30 ml, such as the Diva Cup or the Lunette Cup. Most people who try the EvaCup are very happy with it. It’s an excellent cup that’s made in the USA from top-quality medical grade silicone. It has a nice firmness which means that it’s easy to insert, but also feels quite comfortable. Or, just check out this popular American made menstrual cup on Amazon today. Shipping is usually free with Amazon Prime and delivery is discreet and fast. The Lena Cup is a great choice for “Made in the USA menstrual cups.” It also has a very high rating on Amazon that is higher than just about any other menstrual cup. It is sold as a single cup and comes in a bit cheaper than some of the more expensive cups like the Diva Cup, Moon Cup, or Lunette. Lena cup hopes to put a top-quality, affordable menstrual cup in the hands of everyone who wants one. They have done an excellent job at this! The Lena Cup is usually cheaper than many of their competitors. But, the quality is the same, and many people actually seem happier with the Lena Cup than some of the more experience ones. Many women mention that because of the stiffness of the Lena Cup, it pops open really easily and isn’t prone to leaking. Yet it’s not so stiff that it feels uncomfortable when it’s inside of you. For people looking for a softer option, there is now the Lena sensitive which is one of the softer menstrual cups you can buy. This makes it an excellent option if you experience cramps with some of the firmer cups. There are almost no specific, negative reviews about this menstrual cup and those who weren’t happy with it seemed to just not like menstrual cups in general. It’s safe, and registered with the FDA. Or, just check out the Lena Cup for yourself on Amazon. You’ll see hundreds of satisfied customers and can be one yourself! The Keeper is a little bit unusual in the world of menstrual cups in that it’s made of latex instead of medical grade silicone. The negative is that some people are allergic to latex, or develop a reaction to it after repeated exposure to it. The good news is that the Keeper Menstrual Cup can last for a decade or even longer because latex is far more durable than silicone. Most other ones will have to be replaced at around the five year mark. Although it’s a bit more expensive than other cups made in the USA, it can last for years and years. This makes it actually one of the most economical choices. Seriously, some people report that this cup has lasted 10+ years. The big negative to the Keeper cup is that it’s one of the stiffest ones on the market today. This can make inserting it pretty easy—it’s actually difficult for it NOT to pop open fully. However, some people find this uncomfortable because it can press strongly against your vaginal canal walls, which can cause cramping for some people. If you’re looking for a soft menstrual cup that is made in the USA, then the SckoonCup should be your top choice. It’s very soft, so if you find the stiffer menstrual cups a bit uncomfortable, then try out this one. The small is actually quite small and makes a nice choice for a teenager, or someone who hasn’t given birth vaginally. The SckoonCup Menstrual Cup has some excellent user ratings on Amazon. Most people that try this popular “made in the USA” menstrual cup are very happy with it! The SckoonCup is made in the USA from top-quality, medical grade silicone that approved by the FDA. The thing we love best is that it’s made from one piece, unlike other ones which are made from two pieces of silicone that are fit together. This can make the SckoonCup very comfortable, and also easy to clean. We love this thing, and it’s the go-to cup for one of the writers on this website! There’s a new addition to the Made in the USA Menstrual Cups list! The XO Flo menstrual cup is a newcomer to the feminine hygiene world, but the company, Glad Rags has been around for years and years. They are the makers of the original modern-day cup, the Keeper Cup made of latex. The XO Flo is a whole new design, with new materials and manufacturing processes. It’s not just an updated Keeper Cup, but it’s a whole new thing. 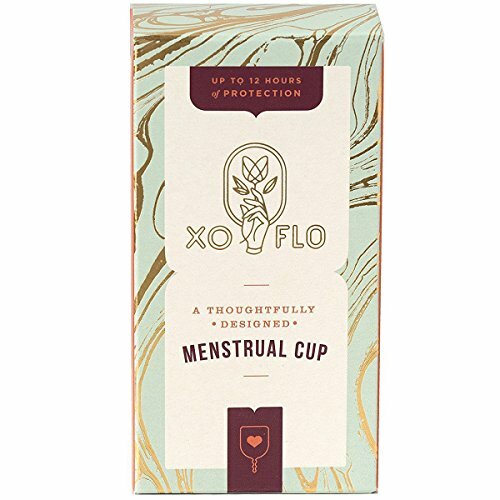 The XO Flo menstrual cup is made in the USA from top-quality medical grade silicone. Heavy Flow? Consider this One! If you have a heavy flow, you may want to consider the XO Flo because it has a high capacity of 38 ml because it can offer some serious protection. Most normal ones have a capacity of 25-30 ml, so this extra 8 ml can really make a big difference. Paired up with an overnight pad, you may actually be able to make it through the night of your heaviest flow without having to get up! For those looking for a small menstrual cup, you may want to consider the XO Flo Mini. We love how soft this cup is because it’s feels really uncomfortable when inside. There are also balls on the stem which help to make removal that much easier. Overall, it’s an excellent menstrual cup and we’re happy to see Glad Rags with a newer, updated offering. 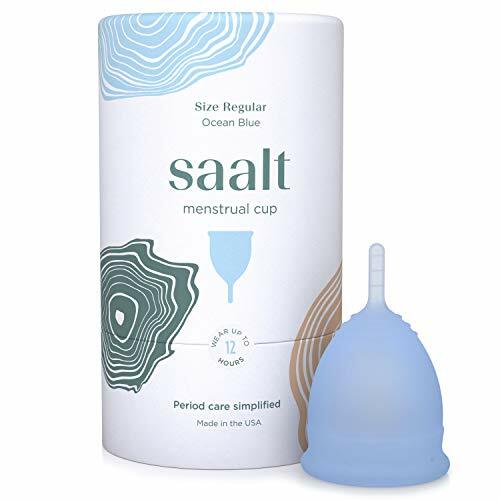 Another newcomer to the made in the USA menstrual cups world is the Saalt Cup. There are some excellent initial reviews of this period cup over on Amazon. We love that the company has a 2-cycle money-back guarantee. Try out the Saalt Cup for two periods, and if you don’t like it, you can get a full refund. We LOVE companies that stand behind their products, and we’re sure that you do too. The founders of the company are committed to having a positive impact in our world. They’ve partnered with some organizations that help bring feminine hygiene products to people without access to them. A company that’s all about social change? Awesome! As far as the cup goes, it’s designed well, and is made from medical grade silicone. Most people who try it seem to be pretty happy with it. It’s reasonably easy to insert, and remove, and it also seems to not leak. What are the top made in the USA menstrual cups? Leave a comment below and let us know your opinion. And, has a menstrual cup changed your life? Tell us about it! Due to the fact that menstrual cups require boiling above certain temperatures once a month, they have faced criticism. In particular developing areas where there is a lack of water, sufficient hygiene may not always be guaranteed. There’s also the Casco Cup/Green Cup of Maine (made in the same factory and appear to be the same design, but sold under different names for some reason) that’s manufactured in Maine, USA. Reviews say it’s similar to a Diva Cup but slightly softer. As for the boiling, washing with soap and water should generally get it clean enough so it’s generally unnecessary, but that still requires clean water so might be a problem in developing areas, maybe people in those areas would be better off being given reusable pads (still need washed, but probably less chance of infection if it’s cleaned with dirty water as it sits outside the body).